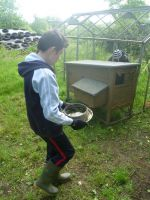 Since the beginning of June, on a Wednesday morning, three of the Year 6children have been visiting Julian’s Farm, West Putford. 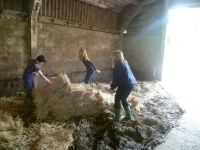 They have learnt about different areas offarm life including feeding calves with milk, silage and nuts, cleaning &bedding the animal sheds, feeding the chickens and collecting their eggs. 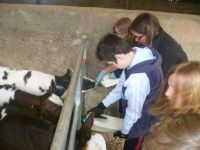 They also met the vet who came to the farm tocheck the health of some of the animals. The children were also lucky enough to attend the Holsworthy AgricultureMarket where they were challenged to pick a calf and guess the price it mightbe sold for.